"Qualified and motivated Ukrainian crew on board of your vessels." Argo Shipping Services Odessa Ltd is a maritime recruitment agency based in Odessa, Ukraine, established in 2006 by Ukrainian and Greek partners as main shareholders. In 2008 Greek shares of Argo Shipping Services Odessa Ltd were bought by Odessa side, however good contacts with ex-partners remained. Argo Shipping Services Odessa Ltd co-operated with Greek, Dutch, Norwegian, Spanish, German, Russian, Estonian and Italian shipowners. During 12 years of successful work our agency provided crew for almost all major types of vessels, specializing mainly on DC, CN, BC, Coasters, Tugs and Pass vessels, providing repair teams for the last ones. Our database contains of more than 20 000 seafarers, a huge amount of which we know personally and can guarantee high level of their job and responsibility. We are interesting in long-term co-operation which will be financially reasonable and interesting for our employers. Experienced repair teams for Dry Docks: electricians, welders, fitters etc. We are professionals with more than 12 years experience in crew management industry. We have fairly big Data Base containing almost 20 thousand of Ukrainian Seamen collected during many years of day-to-day job. We Really Love Our Job and every day improve our service to become more competitive and cost effective for our Clients. We guarantee that our Agency Fees will be Less than those in other crewing companies. Personal Attitude to every Client! We have experience in co-operation with many different Clients and understand well the mentality, demands and different business approaches of our clients. We believe that Long run Cooperation with benefits to all parties is a prime goal of any business activity. For us our Client is Always RIGHT! 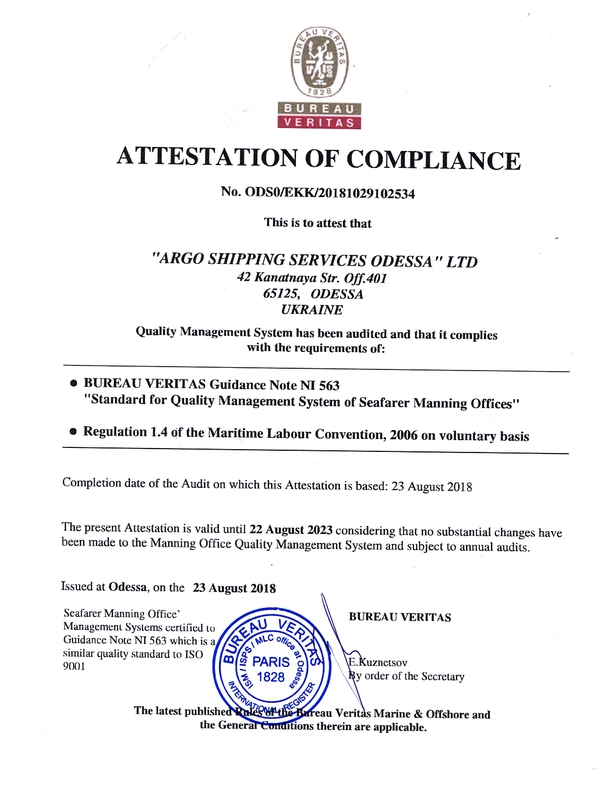 Our own Quality Management System was implemented in 2007, and it was certified in accordance with Standard For Quality Management System Of Seafarer Manning Offices By Bureau Veritas in 2018. The quality system strictly regulates the selection and testing of Seafarers. To ensure that our services meet the Employer's needs and requirements, all business processes of Argo Shipping Services Odessa LTD are being monitored, evaluated, analyzed and improved accordingly.